Comrades representing the Glasgow and Aberdeen branches of the CPGB-ML were in attendance for the induction of new candidate members into the Party in Scotland this weekend. 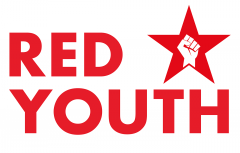 All comrades were active red youth and are typical representatives of the new generation of young workers entering the Marxist-Leninist movement today. A couple of comrades had never been politically active previously, whilst others had tried to be active in the Communist Party of Britain or had left the SWP. All those who wish to enter the ranks of the CPGB-ML as candidates must display a higher level of commitment to the Party than friends or Supporters. The working class does not need another Party purporting to be communist which is full to the brim of well-meaning but inactive stay-at-homers. All the comrades inducted in Scotland this weekend are regular attendees at political education classes which take place weekly and all are in agreement with and committed to the Party Programme, ensuring the highest level of unity in our ranks. After a day of political discussion the comrades heard about the priorities for the national mobilisations of CPGB-ML groups over the coming months. The Central Committee urged all new candidate members to organise with their branches participation at this years May 1st rally in London and the need to reserve tickets for the October Revolution celebration which is being hosted on Saturday 4 November. Assemble Monday 1st May from 10:30am in Clerkenwell Green (nearest tube Farringdon) the CPGB-ML contact for London is comrade Dan (london@cpgb-ml.org). For those travelling from outside of London BEWARE bank holiday rail service disruptions. Those travelling from the Midlands are invited to contact the Birmingham Branch (birmingham@cpgb-ml.org) to enquire about a seat on the Party coach which leaves at 8:00am (£16pp). The 100th anniversary of the Great October Socialist Revolution is also being celebrated on a national scale in London by the CPGB-ML and will be attended by the Aberdeen and Glasgow branches as well as hundreds of Party members from across the country. The CPGB-ML has hired the Dominion Centre in Southall from 4.30pm on Saturday 4 November, tickets are limited to 300 and are available now. Previous Previous post: Reclaim International Women’s Day for the Proletariat!